Seventh grade language arts builds on the progress made in writing and literary analysis in sixth grade. Students continue to explore a variety of literature selections and themes. The class will start the year by reading a series of short stories that each utilize a different writing style and method of storytelling. In this unit, students write their own short stories as they continue to refine their ideas, organization, and voice. The class will read classic works of literature like Of Mice and Men and A Midsummer Night’s Dream. Students will also read Greek Myths as they learn about ancient Greece in social studies. A primary writing focus is learning to write well-structured and detailed essays. Students learn to incorporate evidence to support their own point of view as well highlight an author’s message and style. 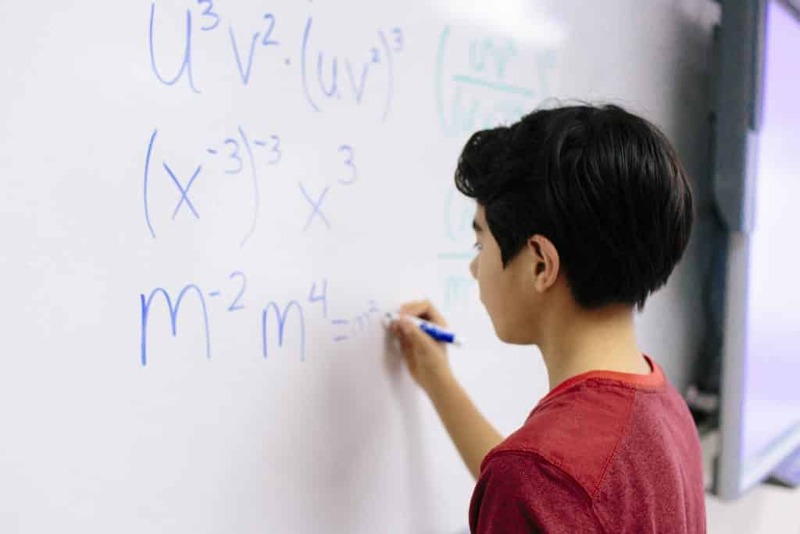 The topics included in the seventh grade math curriculum are expressions and equations, integers, exponents, percents, trigonometry, geometry, and probability. Students learn how to evaluate variable expressions and solve multi-step equations. They identify where positive and negative integers are on a number line and learn to perform all four operations on integers. Students explore exponent rules and apply them to simplify exponential expressions. For percents, they utilize their understanding of how to find a percent of a number to determine percent change as well as simple and compound interest. In the trigonometry unit, students use the Pythagorean Theorem and trigonometric ratios to determine missing side lengths in right triangles. In geometry, students explore the attributes of two-dimensional shapes and three-dimensional solids, and also apply transformations on shapes in the coordinate plane. In probability, students distinguish between independent and dependent events and between overlapping and disjoint events to determine the probability for given situations. In seventh grade science, students begin the year with measurement and the metric system applying their knowledge throughout various hands-on labs. Students later use the Engineering Design Process to create a solution to a real-world problem. During this experiential learning project, students advance their graphing, researching, and analytical skills. Focusing on physics through experimentation and design initially, later supports the teaching of Newton’s Laws of Motion, gravity, and friction. Students investigate how potential energy gets converted into kinetic energy by building a rollercoaster and share their findings with iMovie. The year culminates with students constructing balloon-powered cars that challenge them to apply their physics knowledge in a competitive race. World History is the focus of the seventh grade social studies curriculum. A variety of assessments such as creative writing assignments, analysis of primary sources, and project-based learning are used to determine student comprehension and progress. Students also read novels that are connected to the social studies units to deepen their appreciation for the culture, history and challenges of the land. Students begin with Ancient Greece and study the city-states, government, and important figures from the time. Next, they learn about Ancient Rome and analyze the rise and fall of the empire. Students learn about Ancient Rome’s changing government, impressive inventions, and military conquests. During the final unit on Ancient China, students study the most influential dynasties, their religious beliefs, and the importance of the Silk Road. Students in seventh grade Hebrew focus on being able to speak, write, and read using the present, past, and future tenses along with new prepositions and phrases. Students continue to improve their ability to express thoughts effectively in speech and in writing. Students also read a full-length novel in class to expand vocabulary and experience Israeli literature. Students analyze and describe major events, themes, and concepts in Hebrew. Students focus on historical events leading from the destruction of the Second Temple to the birth of the State of Israel. Major topics include: Jewish expulsion, major events in Europe, Asia and Africa in the early 20th century. They are introduced to famous biblical commentators and their interpretations and style. In seventh grade Jewish studies, students deepen their understanding of Jewish holidays and their historical, natural/agricultural, and faith-based foundation. They learn how our customs and traditions enrich and strengthen them as individuals within our Jewish community. Prayers and blessings related to the holidays are recited and Hebrew stories connected to the Jewish holidays are studied. Students develop a meaningful relationship with Israel through personal connections with language, people, places, and events. As an ancient land and modern state, we teach our students that Israel is a home for diverse and vibrant expressions of Judaism. Through our cutting-edge Hebrew language curriculum, experiential programs, and Israeli young emissaries (Shinshinim), our students engage with Israel at all grade levels and feel a deep connection to their homeland. Students in seventh grade continue their partnership with a sister school in Haifa, Israel. Students in both schools communicate throughout the year and do joint projects to learn more about each other’s cultures and create friendships. Students work with a variety of drawing tools and multiple types of paints and papers in sophisticated ways. Students learn techniques for drawing, painting, printmaking, and collage. Within each grade level, elements of art such as line, shape, form, color, texture, value, and space are taught. Emphasis is put on the process of creating art rather than the finished product. Art history is an important component of our curriculum; students study different artists and art movements from the past to the present. Some movements that may be included are: Impressionism, Abstract, Folk and Pop Art. Throughout the year, art is integrated with units of study in the classroom and teachers work collaboratively on skills and concepts to deepen learning. In seventh grade students take what they have learned further by continuing to analyze texts to inform their performances. Students continue to explore their characters’ motivations while identifying the natural rhythms of the text to aid them in making decisions about how best to portray a character. Students will also work together to decode Shakespeare and perform scenes from the Bard and other playwrights, which leads up to rehearsing for and performing, the spring musical. Additionally, students will have ample opportunities to demonstrate their speaking and debate skills throughout the year. Students in physical education classes are encouraged to participate in sports education, teamwork, physical fitness activities and in game strategy in class. In addition to gross and fine motor coordination, stretching and agility middle school students are taught age appropriate sports skills and team communication through drills as well as game-like scenarios. Units include soccer, flag football, team strategy games, floor hockey, ultimate frisbee, individual problem solving games and basketball. Social team building and sportsmanship skills are woven into game like scenarios to teach students, not only the skills to play multiple sports, but the interpersonal skills to function in a fast paced team environment.